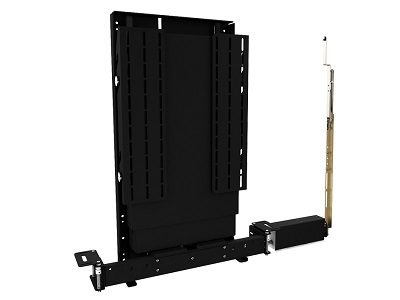 The Future Automation LSM-TU-EFA TV Lift mechanism is part of a new TV lift mechanism range, suitable for screen sizes from 50 inch to 65 inch. The LSM-TU-EFA comes is 3 different models allowing cabinet makers to keep build in height requirements to a minimum. 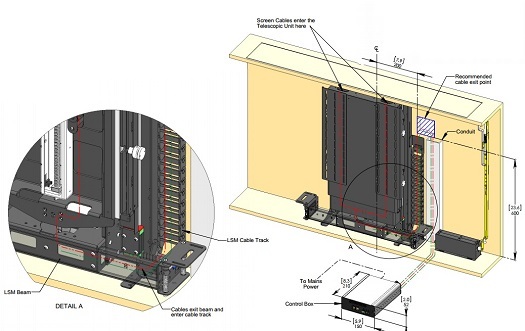 The LSM-TU-EFA is a compact TV lifting mechanism that features a telescopic lift which lifts the screen out of the cabinet up beyond up to 1325mm from the top of the TV to the top of the cabinet. In addition the Lift also features an Electric Flap Actuator. The electric lid is operated automatically just before the screen rises providing a seamless automated appearance. The Lift also features support to bring a panel up under the flat screen TV covering the flap entrance when the TV is up. As with all Future Automation lifts the lift features a near silent motor system which raises a screen from within a cabinet up into the correct viewing position. 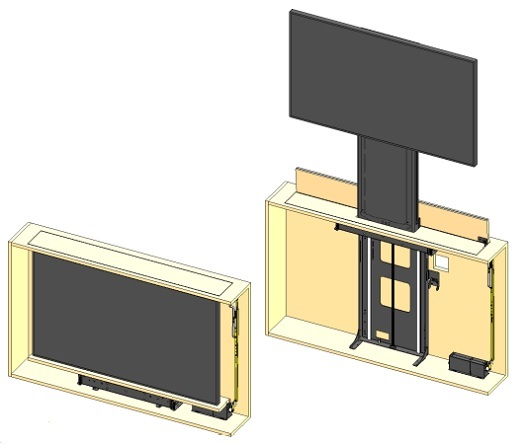 Future Automation's telescopic TV Lift makes for a valuable addition to AV Installs range of TV lifting mechanisms. A push up lid and the limitless width design ensure simple and quick installation and ease of fitting. The LSL-TU-EFA lift can be controlled by RS232, contact closure and as standard comes complete with an IR remote control making it fully compatible with most brands of home automation control systems. Also available is a RF remote option which will allow the lift to operate by remote out of the line of sight, a handy addition if the unit is not being configured to an existing control system. There are three models with different standard heights to choose from, this allows cabinet makers to keep the build in heights to a minimum, below are the details of the maximum cabinet height along with maximum screen heights for each model number, if you require any help please don't hesitate to get in contact on 01604 493 755. Quiet smooth action at approximately 40mm per second. 24V DC motor. Suitable for direct DC supply. Screen sizes 50" to 60"